I was out in the garlic field today and everything is looking great. It’s amazing how fast the garlic grows this time of year. The garlic is taking full advantage of the beautiful weather we are having this spring, only wish we had a little more rain. 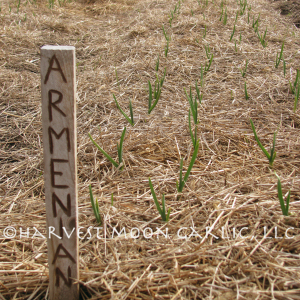 In the picture to the left you can see Armenian, one of our largest and fastest growing hardneck varieties. We can usually expect it to grow 3 feet or more in height and faster than any weeds. I will be adding photos of our other varieties in the next few weeks.